Everybody wants cleaner, fresher carpets. Unfortunately, while vacuums can get a lot of the day to day mess picked up, they simply can't get a deep, thorough clean on your carpet. If you've got allergies, pets, family, or any other complications, it's even more important to be able to get a deep clean. In the past, we often turned to the bulky rental carpet cleaners available in supermarkets and hardware stores. Now, there are affordable options to keep in your home These options will pay for themselves over time, saving you the money you would have spent renting one. ​The Bissell Big Green is a steam cleaning powerhouse that will change how you look at your carpets. ​This lightweight carpet cleaner delivers high-powered efficiency that you’ll love. ​This Bissell carpet cleaner uses heat and advanced technology to take care of even the toughest pet messes. ​The SmartWash makes getting a deep clean easy, and hassle-free (with no guesswork, either). This affordable carpet cleaner delivers a deep clean at a price you can’t turn down. ​This deep carpet cleaner gives you Best In Class suction power and one pass deep cleaning. This carpet cleaner comes from Bissell, a brand you already know and trust for their high-quality cleaning appliances. Since it is a heavier model, it features a “no-tip” design so you don't have to deal with the extra mess from an overturned appliance. To be fair, the extra weight is well worth all the power it packs in. That includes the high-powered motors, oversized power brush, and the cleaning power that outranks any of the rental cleaners you’ve used before. It has a two-tank design. For you, that means a lot more cleaning ability and a lot less hassle. The two tanks keep clean and dirty water separate so you don’t end up putting the gunk you just cleaned up back into your carpet. The other plus side is that you’re not stopping your cleaning to make trips back and forth to change your water tanks. The Hoover Power Scrub is easy to use and even easier to move around. So, if you dread the idea of cleaning your carpets for the strain of lugging around heavy appliances, you'll love how light this carpet washer is. It's fair to say that just about everything about this carpet cleaner is designed to be efficient and easy to use. It includes spill-free tanks for extra peace of mind. These tanks are super easy to change out and clean. With this carpet cleaner, you've got a multiple brush system that works to give you a more thorough clean. It'll also automatically mix your cleaner or detergent and you can use the rinse mode to make finishing up the job even faster. The heat force mode pushes out heated air to speed up dry time, helping to lift out extremely tough stains. This carpet cleaner is a must-have for people with pets and kids. If there’s a mess or stain the ProHeat can’t handle, it hasn’t been discovered yet. A large part of this is because this particular carpet cleaner leverages the power of heat from the very start. As soon as it starts working, it’s already working to take care of the toughest messes as they come. Mud, juice, pet urine, and other messes don’t stand a snowball’s chance. The ProHeat adds another dimension of convenience with a low-profile design. What that means for you is that you will be able to get under furniture. In short, you can get a more thorough clean without having to take all the furniture out of the room. If your pet tends to get messes on your furniture, don’t worry. The 2-in-1 pet upholstery tool can steam and sanitize those tough stains from your furniture and fabric easily. The Hoover SmartWash has a ton of features you’ll love. However, the best feature of all is that it makes it super easy and hassle free when you need a deep clean. Basically, it’s set up so that you have minimal work and measuring (because cleaning your carpets counts as enough work, even if it’s super easy). The SmartWash automatically measures the optimal mix of cleaning solution and water to add, so you don’t have to bother with prep work before you get going. It does more than measure solution and deliver a high powered clean, though. The auto clean sensor feature detects what needs to be cleaned, how it needs to be cleaned, and the order the cycles need to go in. It's also set up intuitively. This means you can simply push forward to wash and pull backward to activate the drying. Since the automatic drying feature also uses the Hoover Heat Force technology, you get a faster, drier finish. This carpet cleaner is a definite staple for anyone that wants to deep clean their carpets without breaking the bank. While the price point is definitely an attractive feature, the PowerLifter also gives you everything you need and expect from a quality carpet cleaner. You still get powerful Bissell suction and durability, with some added convenience and new features, too. First, the brush system is a rotating power brush with four rows. If one brush row won’t get a tough stain out, rest assured that four will. Coupled with its tough suction power, this feature ensures the ground-in messes get right out. This carpet cleaner is built for convenience. It includes a tidy, two tank system to store clean and dirty water separately. That's a good feature on its own, but the tank design also makes emptying and cleaning the carpet washer incredibly simple, so you’ll be ready for another use in no time. We’ve already seen that Hoover can deliver a high quality clean, no matter what product of theirs you’re using. 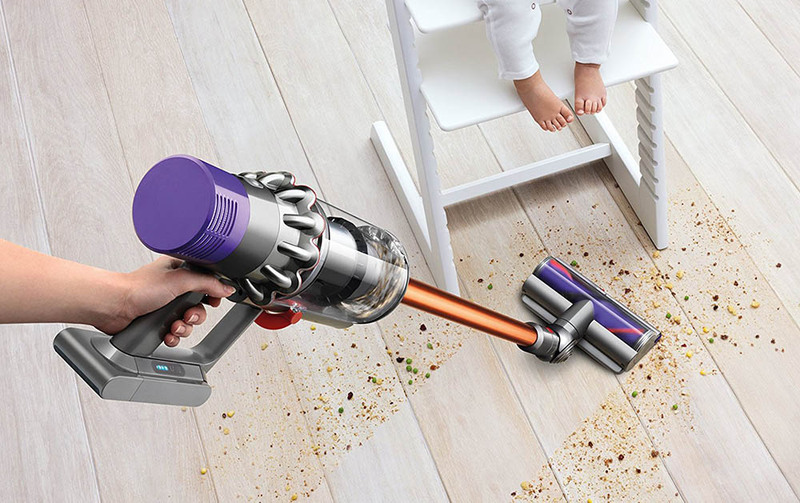 This SteamVac lives up to that reputation and delivers results that’ll impress even the pickiest cleaner. The brush design is one of the most attractive features on this vacuum cleaner. The patented brush delivers a deep, 360 degree clean on every spot it covers, so you know every single bit of carpet you go over has gotten the same treatment. If you want to be able to use the SteamVac in all the rooms in your house, you’re in luck. It comes equipped with three power level options (which is already a rare feature to find in a carpet cleaner). If you have low surfaces or materials that need extra-gentle care, simply use the lowest setting and clean without worry. What about those times when there’s just a sudden spill? There’s an option to turn the brush roll off too. You’ll get spills up in a snap thanks to this feature. If you’ve ever heard of carpet cleaners before or seen them in the store, it’s 100% likely that you’ve heard of the brand “Rug Doctor.” This line has a legacy of experience in delivering professional quality carpet cleaning. This Rug Doctor is a deep-cleaning model that brings commercial quality carpet cleaning into your home. This cleaner boasts best in class suction power, meaning it’s got 75% more suction and cleaning power than any other carpet cleaner in its class. This is enough to impress anyone! Even better, you don’t have to waste time going over tough areas again and again. Because it’s built with dual cross-action brushes, it cleans from several angles and you’ll get superior carpet cleaning with only a single pass. Since it’s also incredibly easy to maneuver, use, and store after use, you’ll find yourself grabbing for it at every tiny spill. ​First, you need to get everything ready to make your job a little easier later on. First, mix a solution of equal parts white vinegar and water (ex. 1 cup vinegar, 1 cup water). Pour your solution into a spray bottle. Next, you'll need to move all the furniture out of your way. You don't have to, but it's the only way to get every inch your carpet clean. ​​Vacuum your carpet for the best results, and the deepest clean. Then, sprinkle baking soda lightly over your carpet. ​​Spray your vinegar and water solution over your carpet and give it a couple minutes to work with the baking soda. The goal is not to soak your carpet, just to get it damp. ​​Use a scrub brush and work in a circular motion. It's easiest to start at a far corner and work your way across the room in rows. This will take a good amount of time and work, but don't get discouraged. You may also need to keep an extra brush handy or stop periodically to clean your brush. ​​Let your carpet dry thoroughly. This can take a while, so be patient. Running a fan in the room will help speed it up the drying process. Another option is to do this process on a warm, dry, sunny day. ​​Vacuum your carpet once it’s entirely dry. This will help your carpet fluff up again, and it’ll take care of any remaining debris. Then you’re free to move your furniture back in. The above process is for when you need to disinfect your carpets and don’t have a steam cleaner. If you do happen to have a steam cleaner or carpet cleaner, your work just got a lot easier. Follow the first two steps listed above. Then, instead of pouring your solution into a spray bottle, pour it into your carpet cleaner’s tank. You can use your carpet cleaner as you usually would, working methodically. You may notice a slight vinegar smell once you’ve finished, but don’t worry. The vinegar smell generally disappears once the carpet has fully dried. At that point, you can go ahead and move your furniture back into place. A good carpet cleaner can make all the difference in your home. You'll get floors that are truly clean and get rid of the bacteria, pet dander, and allergens that get mashed into your carpet. With these carpet cleaners, you can get a fresh steam clean whenever your floors need it, not just when you can get around to the hassle-filled process of renting one. With any of these featured cleaners, you'll get a brand-new appreciation for the feeling of fresh floors.